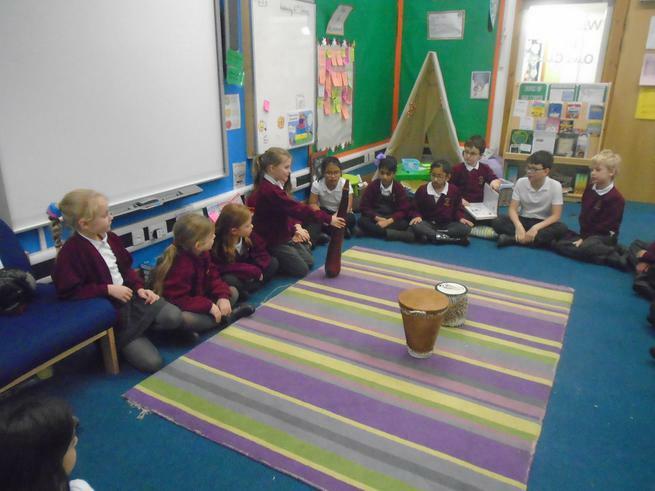 This afternoon we created our own samba band as a class! 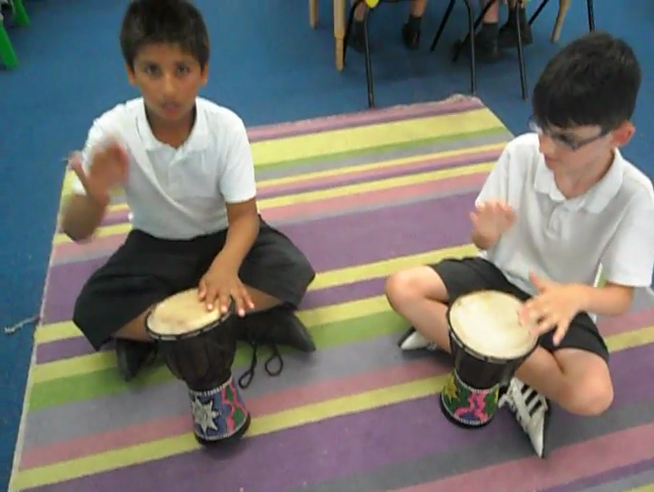 Can you hear all of our different rhythms? 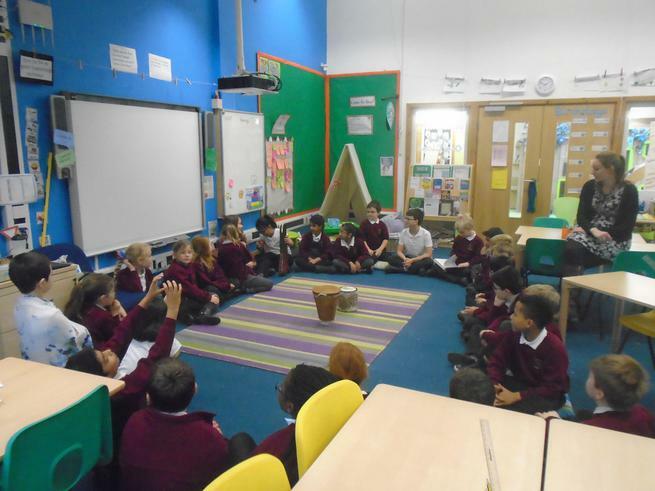 This afternoon we explored how the Anglo Saxons may have lived in their village communities. 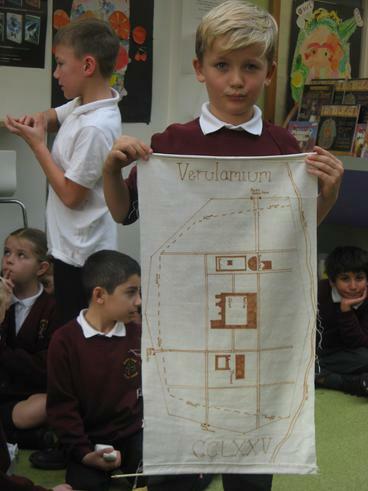 We learnt about food, houses, artefacts, village layouts, runes and even riddles! 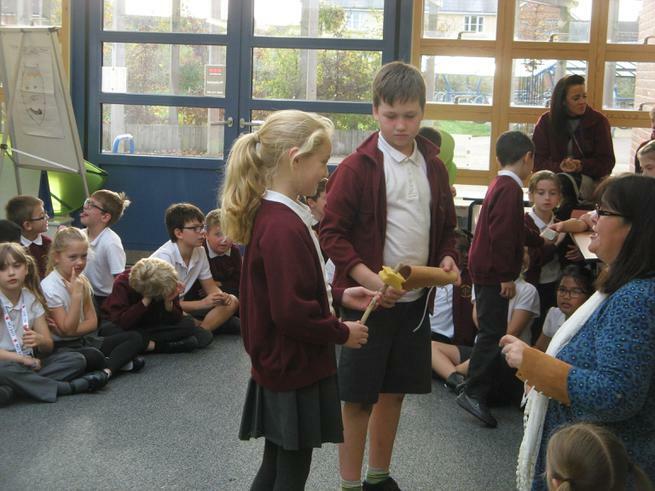 Some of us decided that we wouldn't have been able to survive on an Anglo Saxon diet of stew, rye bread and cabbage!! 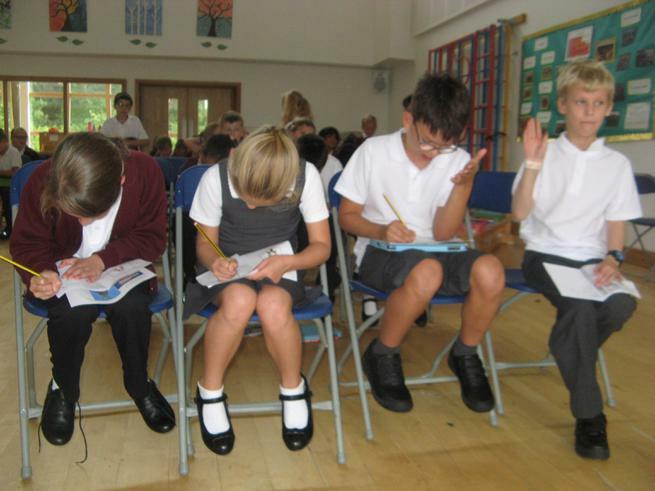 Today in Maths, the children were given the task of working out when I need to fill my car up with petrol. 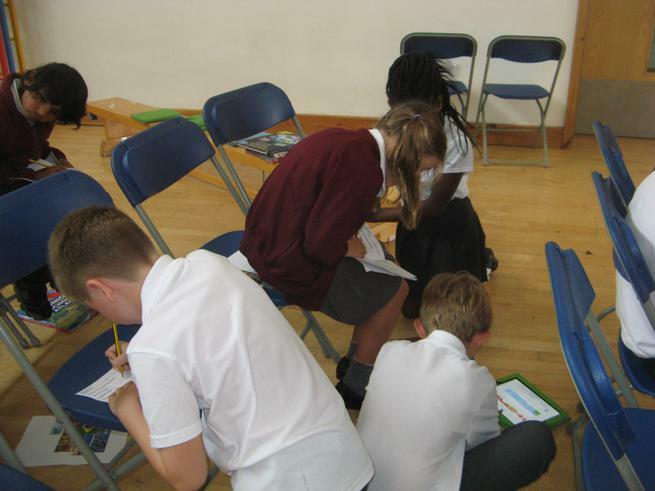 They worked so hard in groups or pairs to solve this problem. 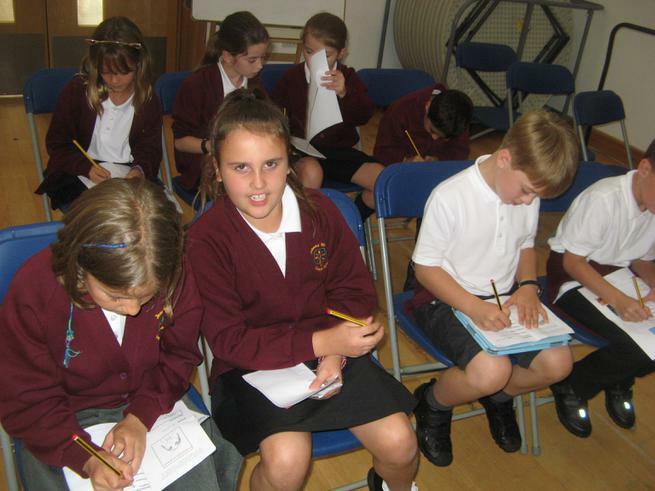 There was a huge 'buzz' in the classroom of everyone busy learning and using a range of different skills to help me out! With 12 miles left to go, I will be filling up after school on Friday! 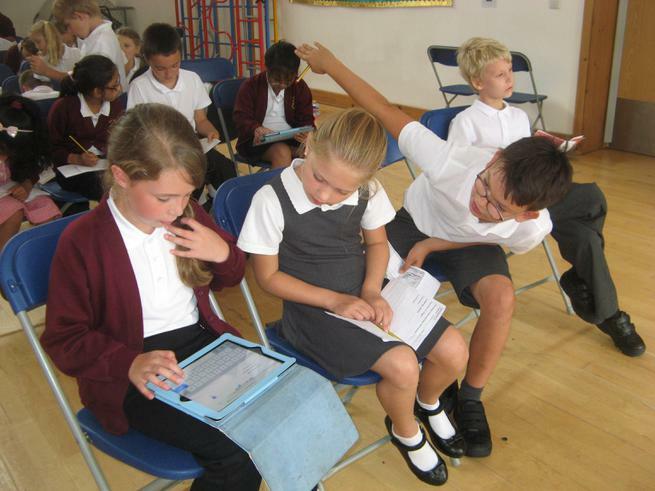 We then calculated how much time I spend travelling to and from school......the result was a bit worrying!! 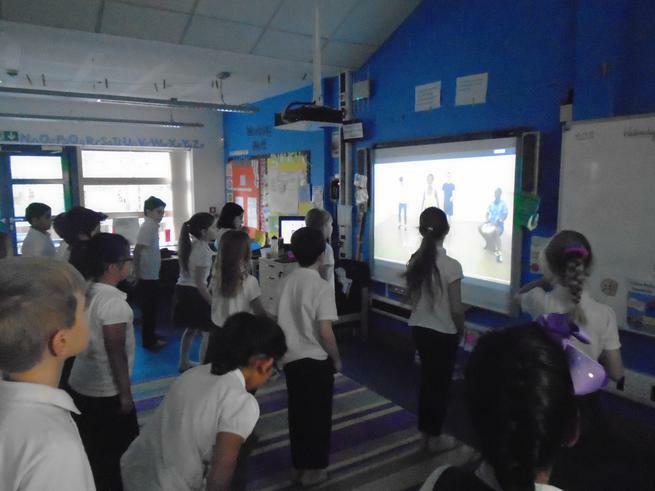 Have a look at the problem and see what the children had to do! 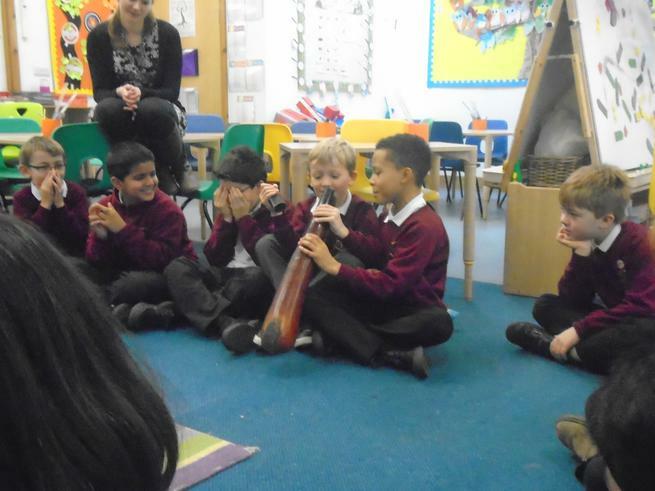 Thank you Imogen for a rather informative and interesting show and tell that you shared with us today! 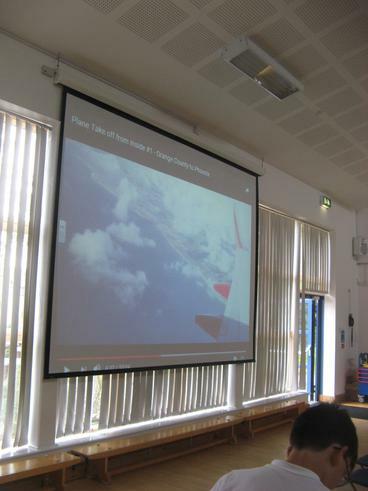 It was absolutely fantastic to see how much effort Imogen put into her presentation and mini talk all about Malaysia. She even brought in a coconut for us to hold. 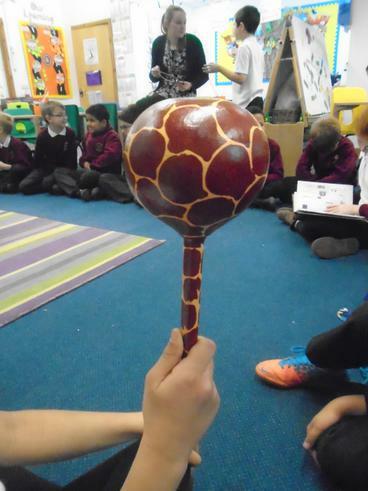 Since being back at school this year we have been learning lots about Africa. 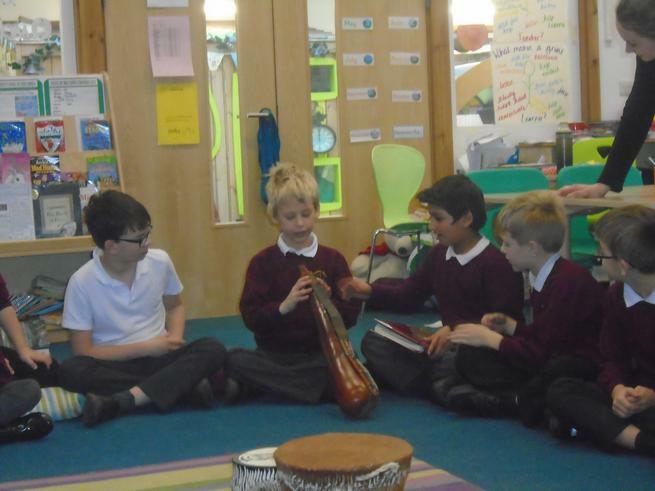 We have been exploring the countries that make up the continent of Africa, singing a Swahili song, dancing and listening to African folk tales. 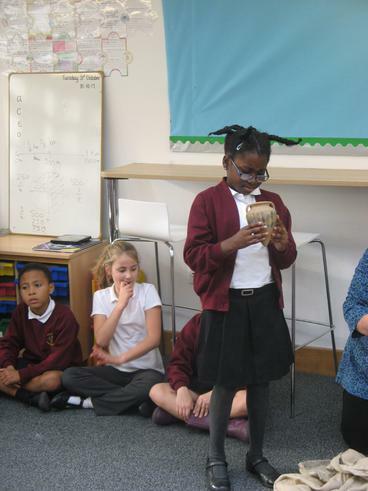 In Owls we were very lucky for Millie to bring in lots of African artefacts that she very expertly shared with us last week! 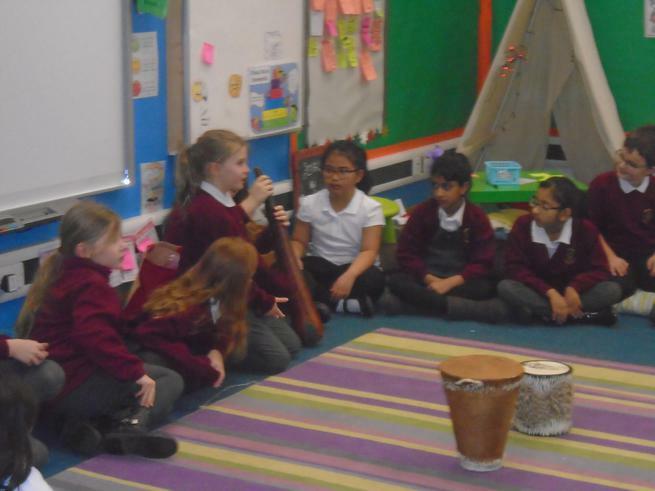 The class loved looking at and holding some of the African objects and instruments that Millie had brought in whilst she explained what they were and where they had come from. Check out the pictures below to see some of the things we explored! Some Owls enjoying their books in Starbucks! 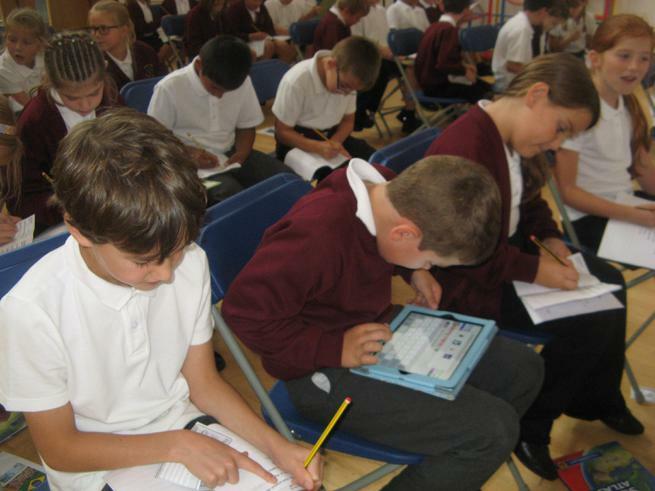 Writing a Read and Recommend note. 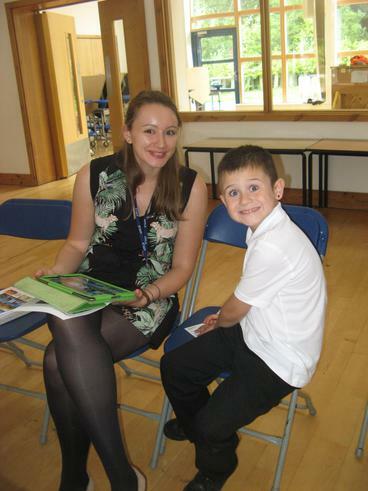 Sharing a funny part of a story with a friend! 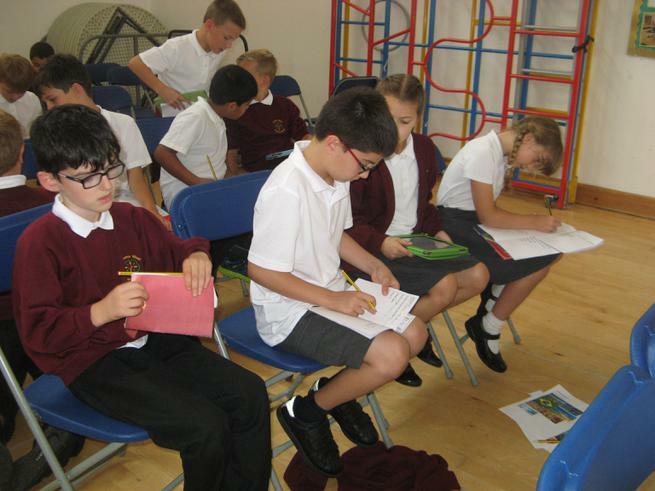 Last week in Owls class the Starbucks cafe was opened for the children use as a place to sit comfortably and quietly to enjoy reading their books. When the children come back in from lunch, there is coffee shop style (soft jazz) music playing which helps to set the mood for a relaxing half an hour dedicated to reading for pleasure. When the children have read a book they have enjoyed, they have opportunity to write a Read and Recommend book review about it which they add to the collection of reviews on the wall of the cafe. 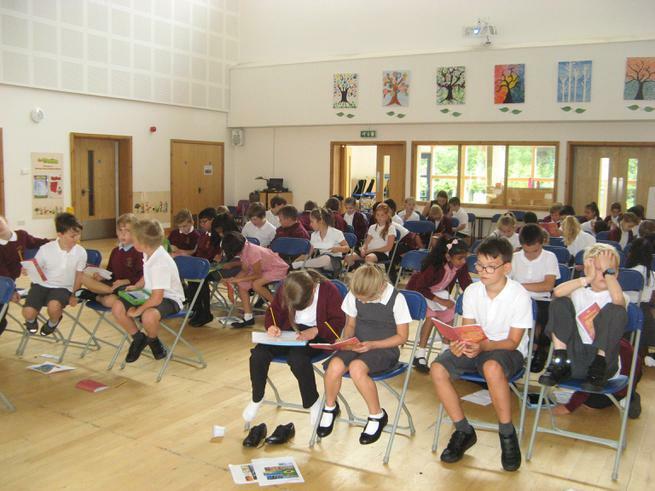 This helps other children to find an exciting and interesting book to read. 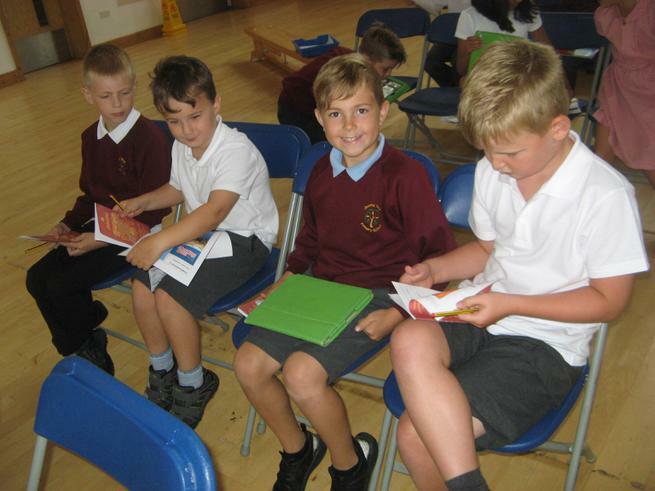 There has been such a buzz about reading with all of the children discussing which book they want to choose next and even reading their favourite parts to a friend! 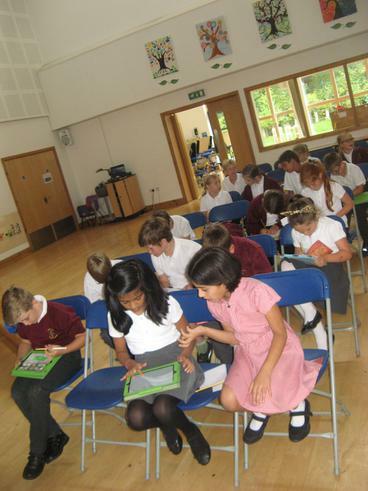 Check out the pictures below to see it in action! 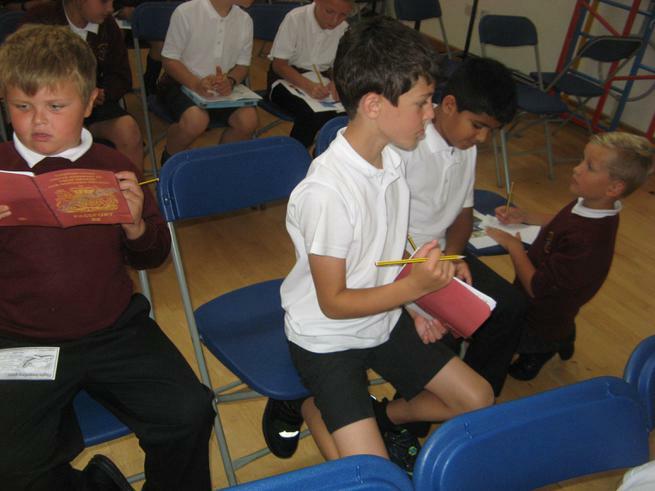 Last Friday, it was Roman day for year 4. In the morning, the first thing I did was to make a shield. My shield had arrows coming out of the corners and wings coming out of the side. The main colour was orange. After that we did a formation. 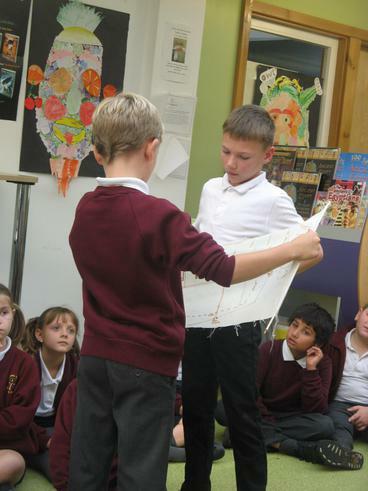 Later I went back into my class to make a Roman road. It was made out of biscuits. Then it was break. 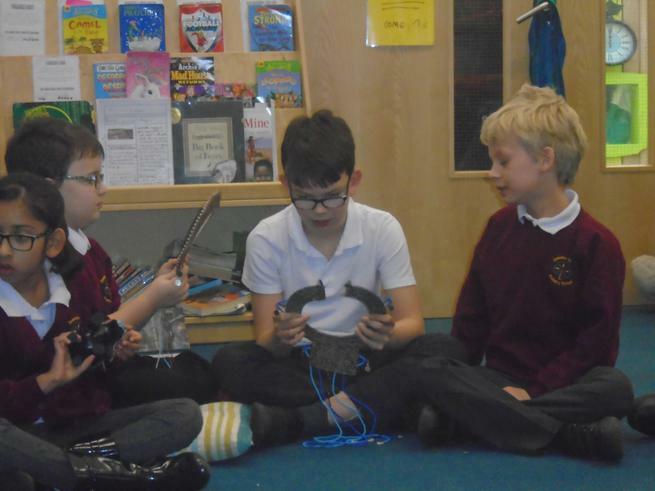 Me and my friends played a Roman army game. Then when break time was over I went to the Woodpecker's teacher. We were making food. The food we had was peppers, olives, cheese, bread, dates. While we were making the food we got to eat the left over food. 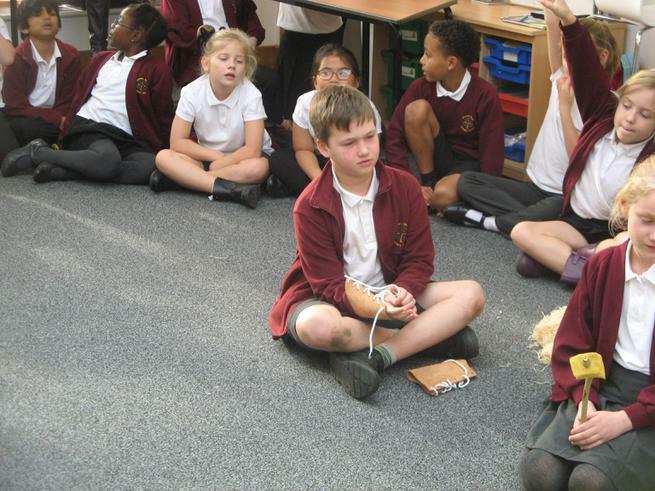 When I got back I was in Woodpecker's class to play games. The game I played was were you had to get three in a row. I won fourteen games. When I got to my class it was lunch time. Me and my friends were finishing off the game I was playing at break. When lunch was finished we had a feast. I was lucky because I had the platter that I made. It was yummy. After, it was home time. 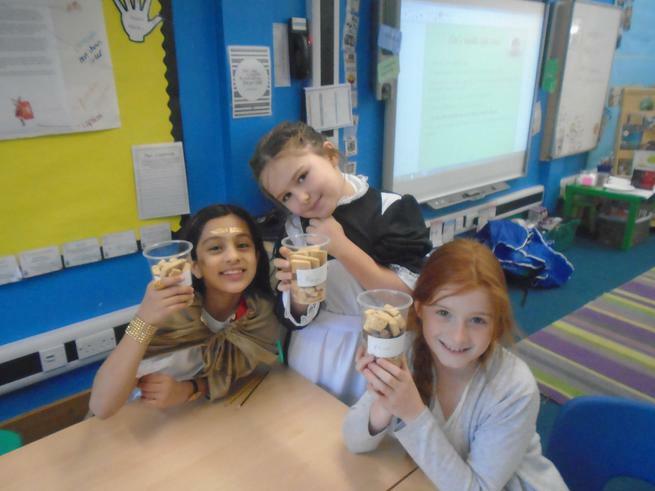 We got our Roman Roads that we had made. 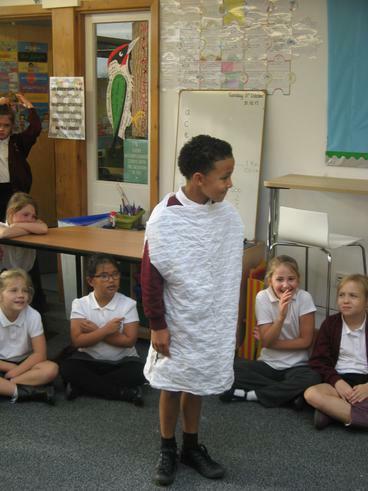 Romans would wear togas which were long dresses. 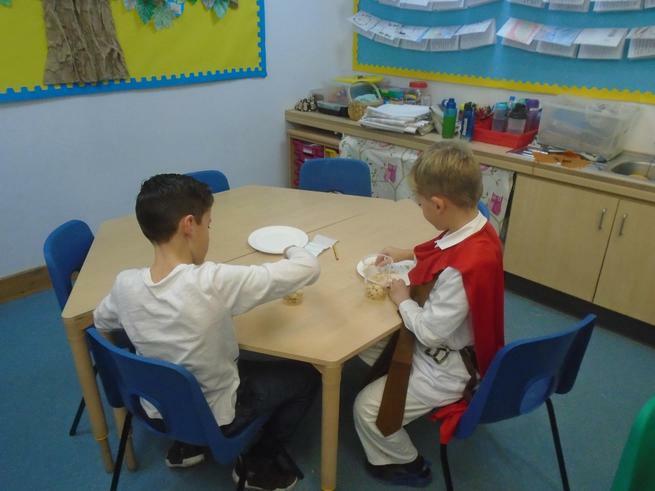 Roman soldiers would wear lots of armour like a helmet, a shield and shiny armour. Roman slaves wore tunics which looked like long modern t-shirts. We used lots of ingredients. But unfortunately we made it out of food. 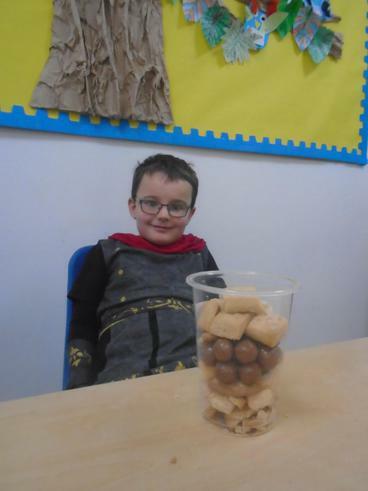 The ingredients we had were rich tea biscuits, sponge biscuits, oreos, malteasers and short bread. It was very yummy. 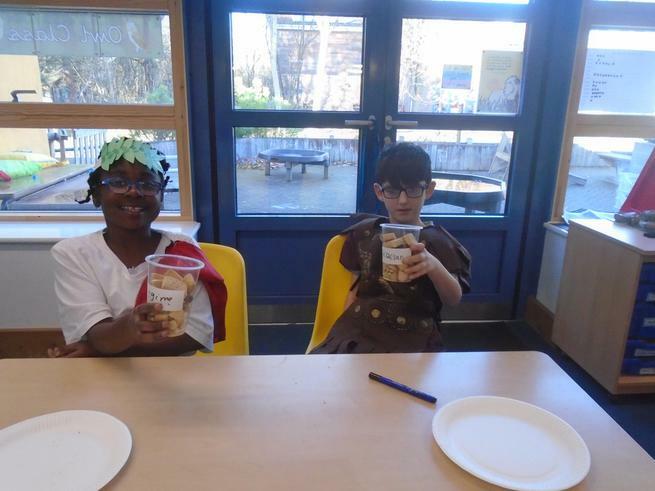 We made Roman shields out of sugar paper and paper. We got to decorate our shields. 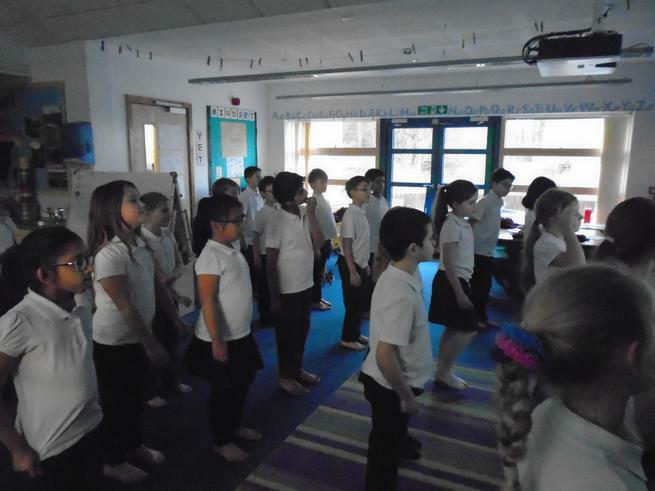 We learnt lots of formations like the tortoise and the triangle. 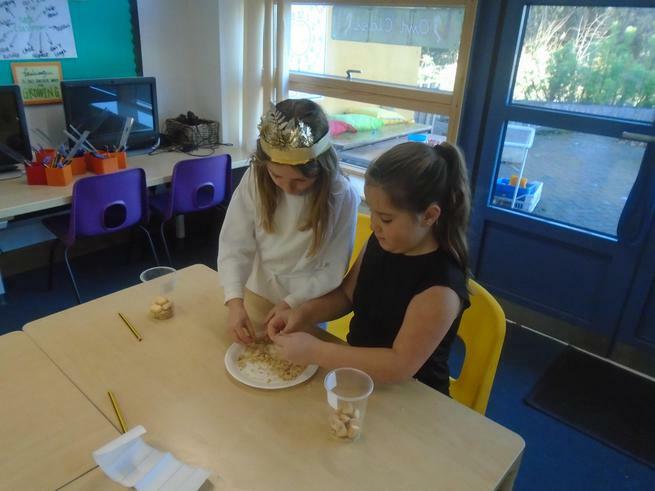 We got to prepare the feast and we tried lots of food we've never tried before. 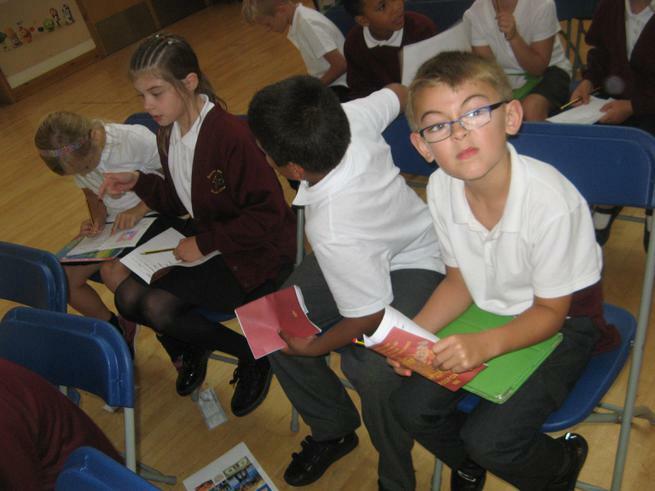 We have a stunning topic called 'The Romans'. 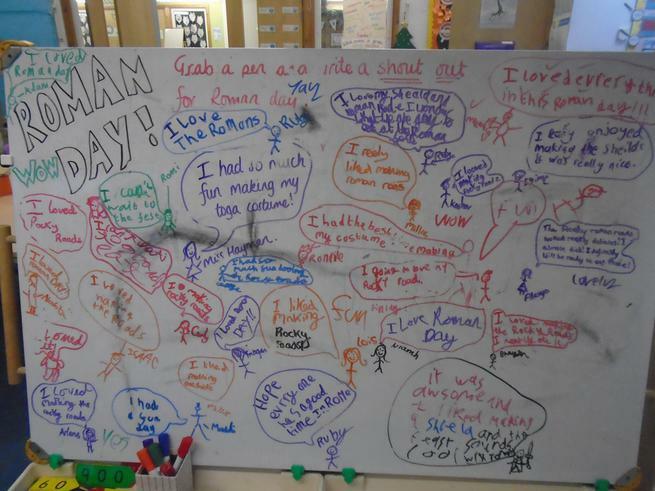 I would like to explain what we did on Roman day. 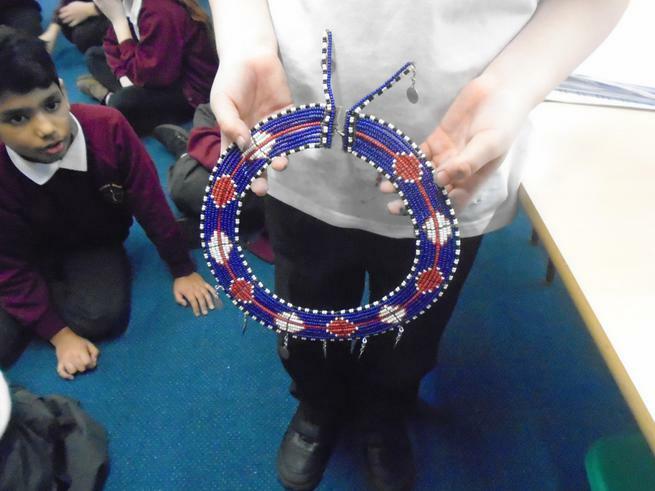 First, we made shields. I like my shield because mine had wings and lightning coming out of it. Then we made Rocky roads. They were not actually road. They were made out of crushed tea biscuits, sponge fingers, an oreo, malteasers and shortbread. 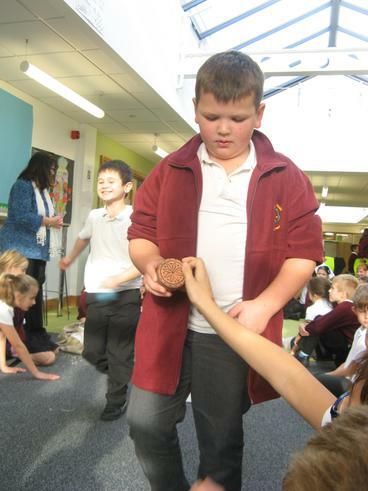 We presented them in layers to make the cement and stones. Later then, I went to the DT room to do cooking. Me, Akshita, Romaio and Isaac did team work to make our platter. After that, me and Akshita played rota. Soon after, I went with my class to go to the hall. In the hall I had a feast. 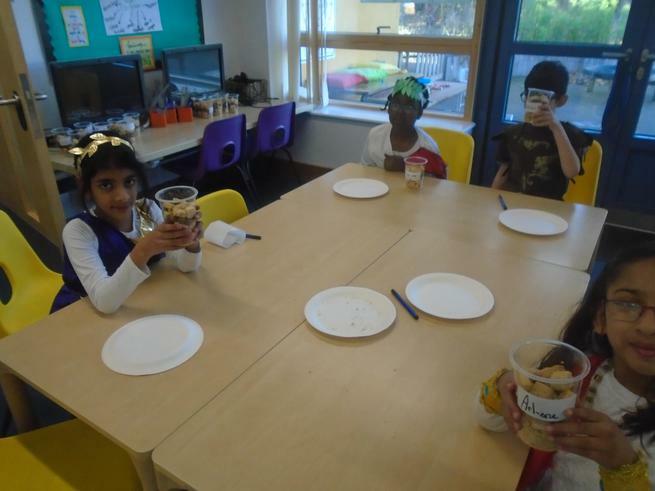 On our table we had figs, dates, pepper, olives, feta cheese, pitta bread, baked bread and hummus as a dip. Soon, it was time to say goodbye but the fun hasn't stopped because we get to eat our rocky roads!! 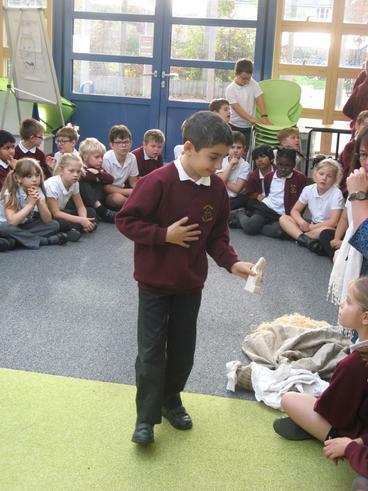 Hi my name is Mummin and I am going to tell you about Roman day. 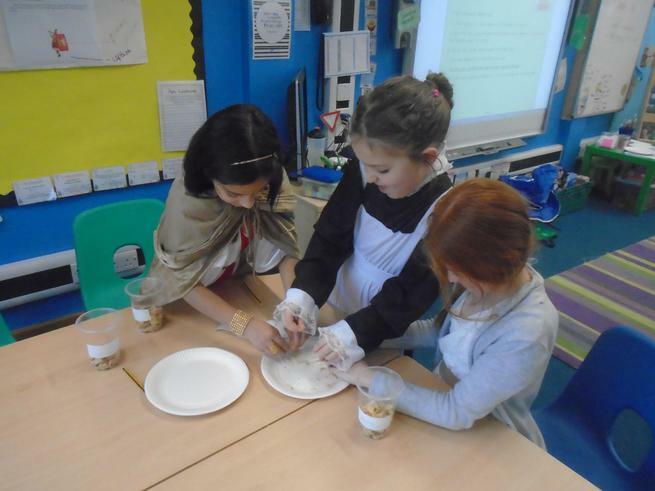 They enjoyed making Roman lamps. 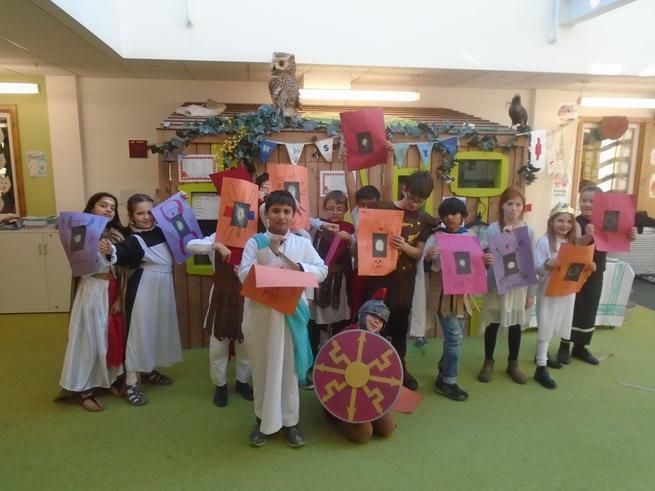 They even made Roman shields. They made a Roman road out of sugar things that don't contain egg and butter. 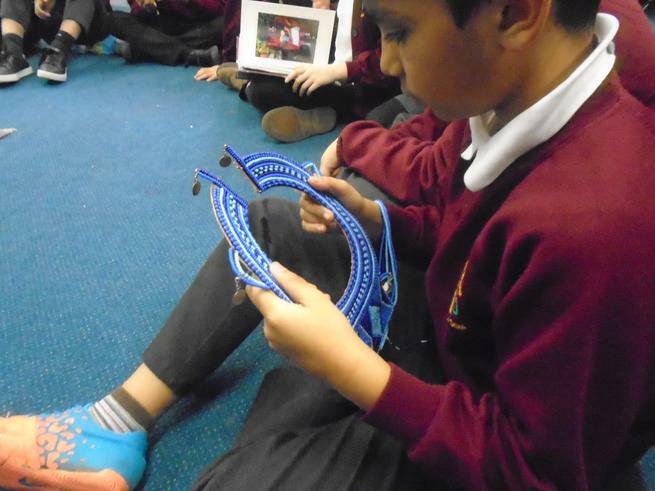 They even played Roman games and when they played the Roman games it was really fun. 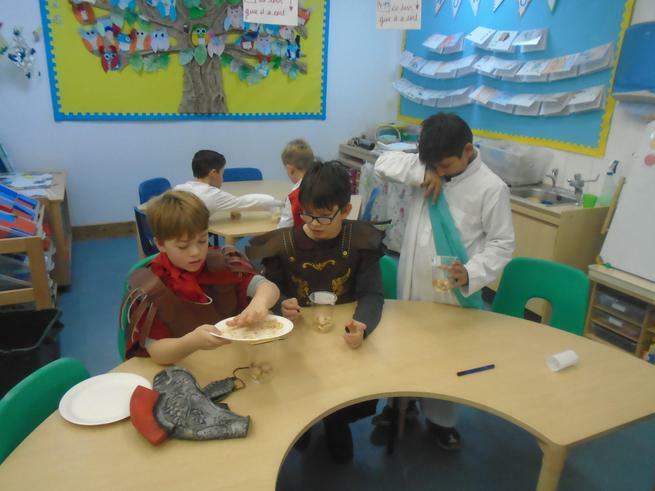 We even had a Roman feast and we all wore Roman clothes. 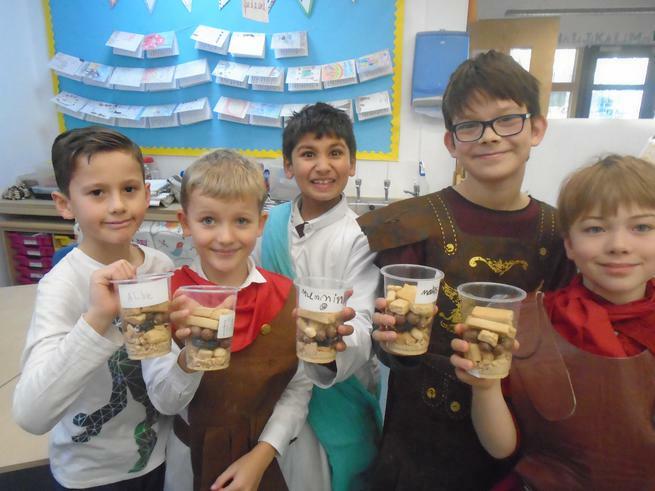 Our class made the Roman food. I hope you had a nice time reading this. 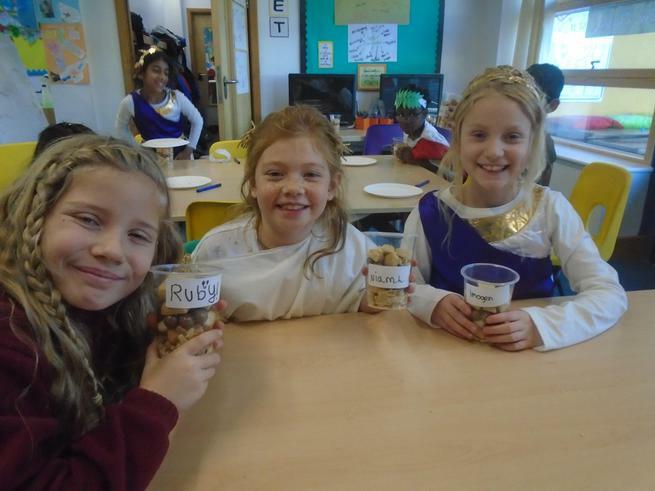 We have been learning about the Romans this year so our teachers, Miss Hayman, Mrs Allen and Mrs Reynolds decided to have a Roman Day. 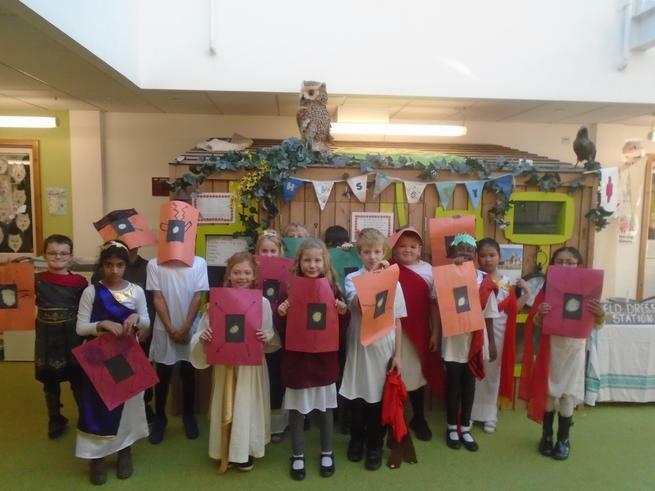 For our Roman Day we all came to school dressed as a Roman. First we got into two equal groups. 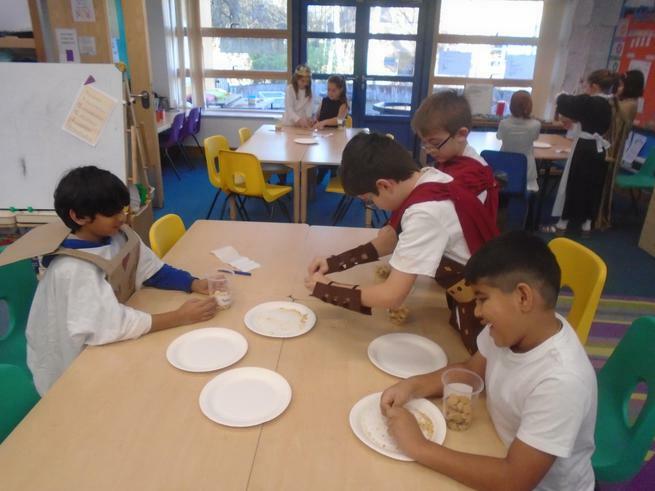 Then one group went with Mrs Newton and made shields and had a go at formations while Miss Hayman's group made some Rocky Roman Roads. 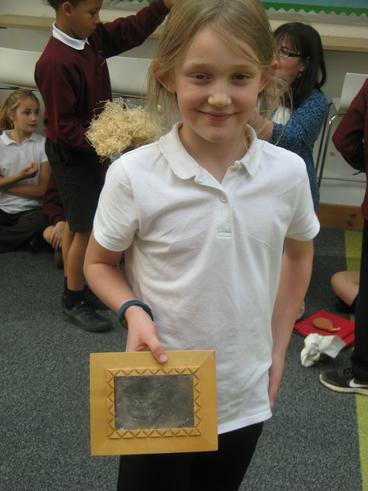 After that we swapped over and I went to make a shield with Mrs Newton. My shield looked like this. 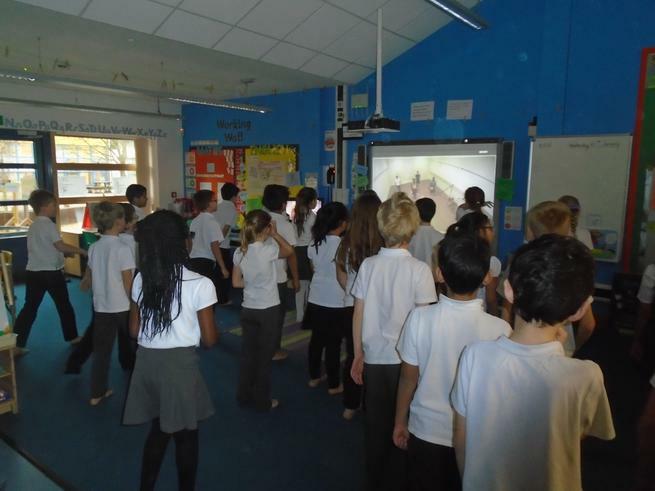 Then we learnt some of the formations that the Romans marched into battle in. One of them was the turtle. 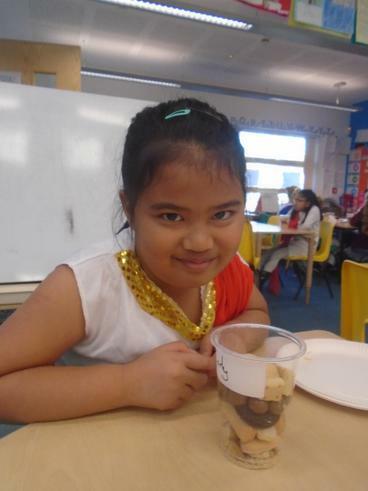 On Friday, we had are Roman day. Everyone was dressed up and I thought it was brilliant. 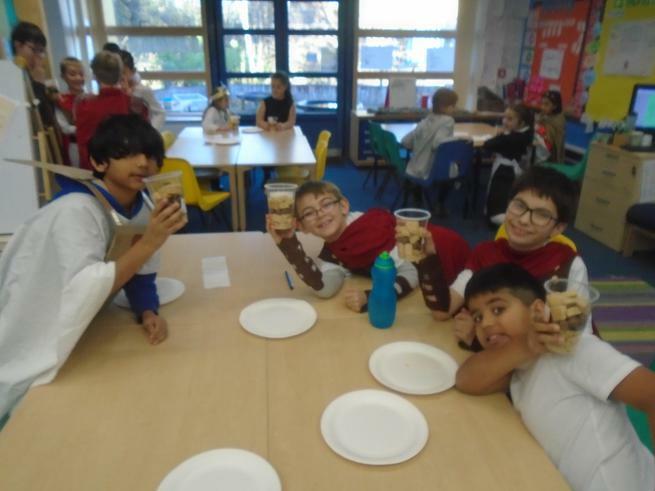 We did rocky roads, shields, cooking and some games and at the end we had a big feast. I know we all want a break from work or school! We don't want to go into politics! 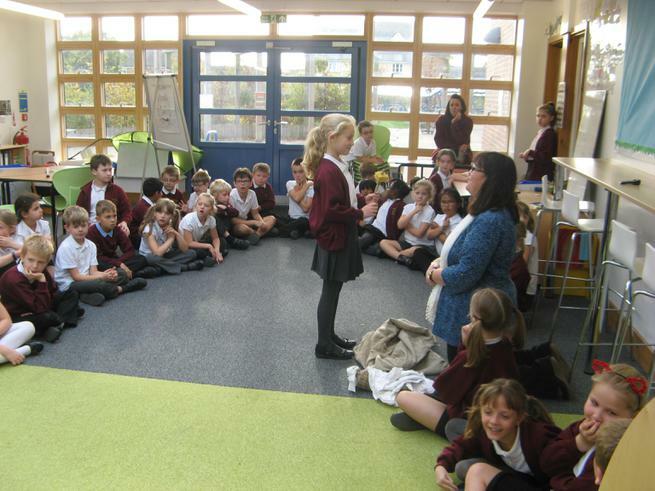 So, our Jeavons Wood 'News Round' doesn't get into that! We, today in News Round (music playing in the background) will be focusing on the Revolting Romans! 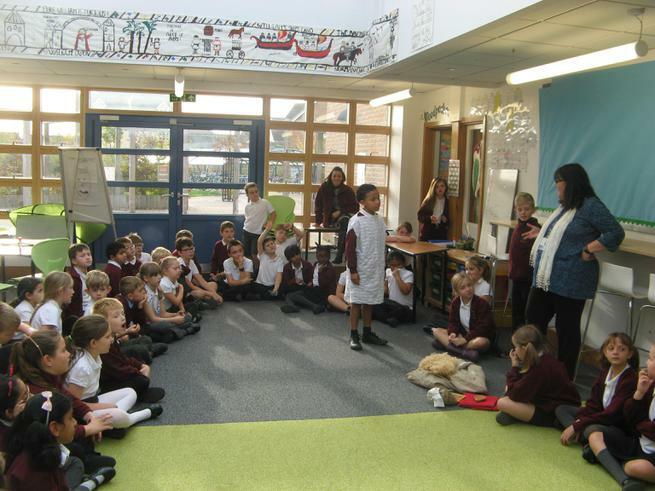 Jeavons Wood even had a Roman based WOW day! There was a feast, cooking and fun activities! So, let me tell you from the start. 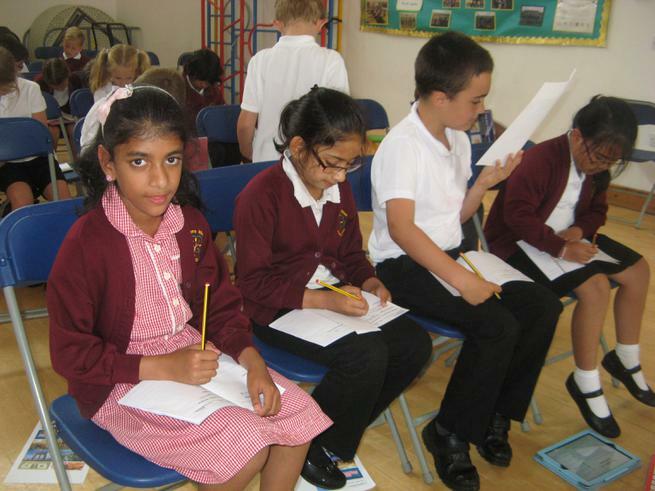 First, everybody came into school as a Roman. Everyone was registered and then they made some lamps out of clay (personally, I think mine was the best!). Then, we all went out to break. Alesya, my friend, even became my slave! 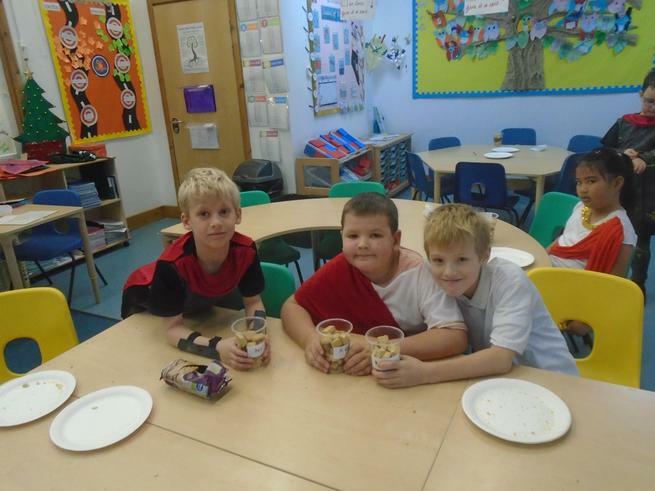 After break, the Owl Class made some rocky roads! I can't remember the exact order of the ingredients but I think we put biscuits, sponge fingers, fine biscuit crumbs, Oreo, Malteasers and sugar biscuits. We cleared up for the next group and headed out in the agora. There, we decorated out own shields. Then we went out for lunch (we had fish fingers, yum!). After we came in, we went in the kitchens and we made some feasts! We carried the food down to the grand feast hall and we ate. There was everything! Bread, pitta bread, olives, feta cheese, peppers, figs and so on! Finally, we packed out bags to go back to our Roman Villas. And that's it for now, I am Saachi, News Reporter. We will be back at 9pm. 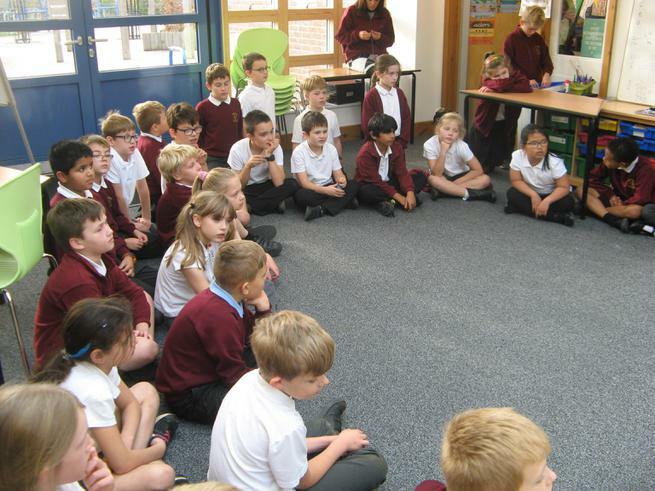 On Friday 1st December, Year 4 had a day dedicated to all things Roman to immerse us into the topic we have been learning about. The children all had a fantastic day and looked amazing in their costumes. 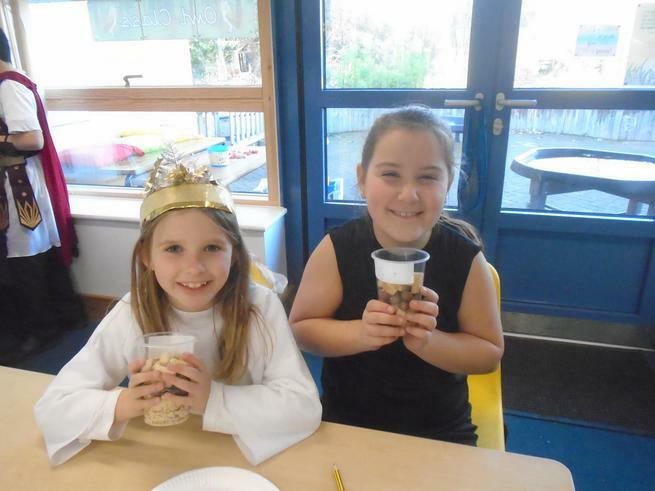 During the day, the children made their very own Roman lamp out of clay, made Roman shields and got into different formations, made or prepared food for the feast, played Roman games and made a Rocky Roman Road from a variety of sweet treats. 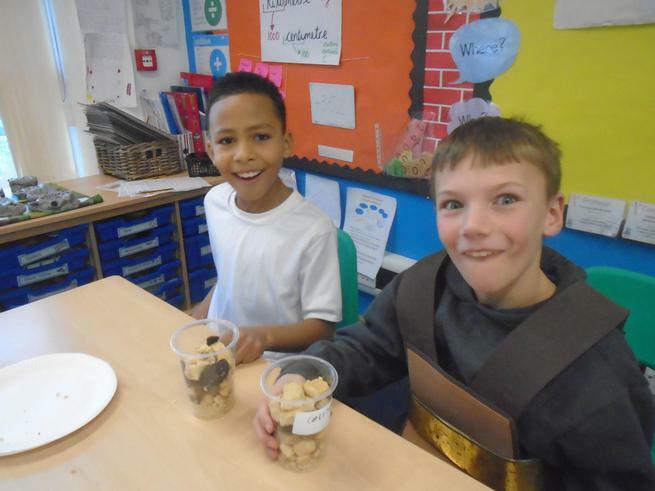 It was a fantastic day that ended with a Roman feast. 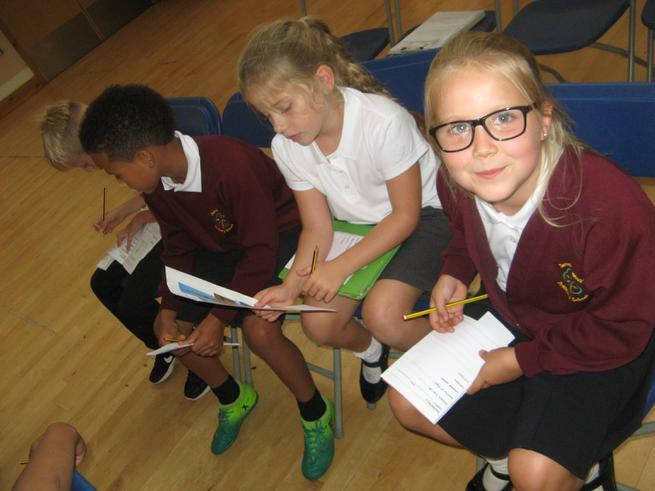 Enjoy browsing through the pictures below to see the learning in action and reading the children's news reports written for homework about their day! 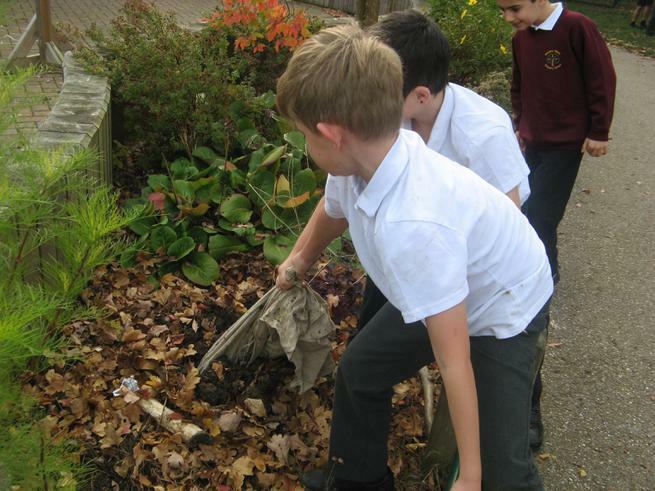 After going outside to find Newts for Mrs Wright, Oliver and Aiden discovered a strange material sticking out of the soil. A bit of muscle power later and some tugging revealed a strange and quite heavy sack. 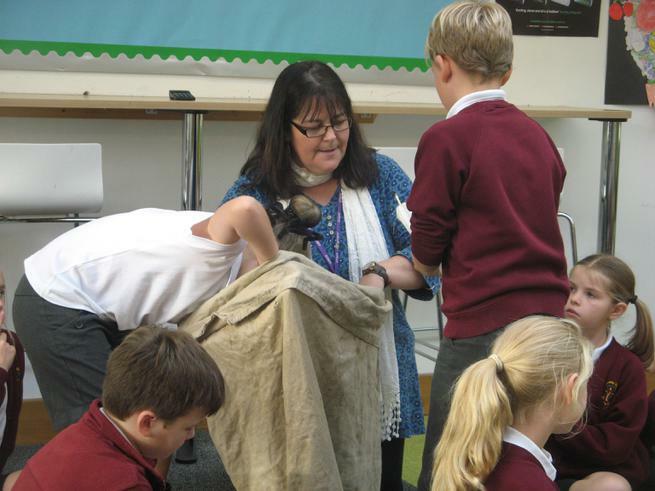 We decided to leave the newts to themselves and take our exciting discovery into the agora to explore the contents in the warm. pottery child's spinning top which we thought might have been a food crusher! 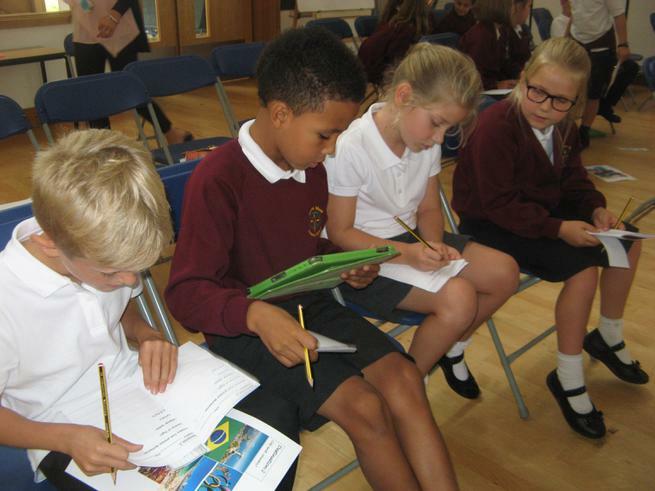 As we'd accidentally become archaeologists, we decided that we needed to formally record our findings. 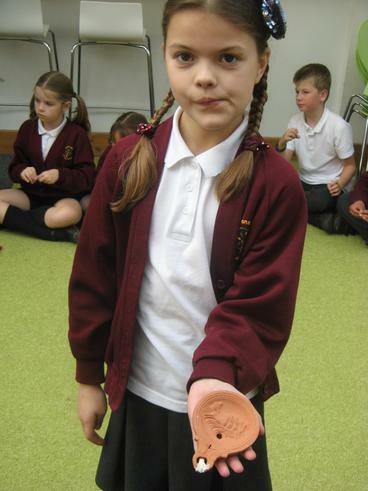 Using an Artefact Catalogue sheet, we drew each item and then wrote whether we thought it was a genuine Roman artefact or not and why we thought this. 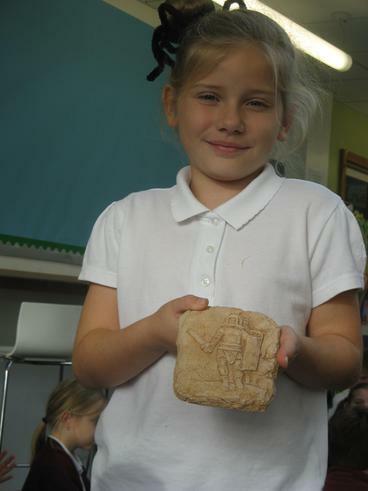 We're really excited to see what else we will be able to find out about the Romans Topic! 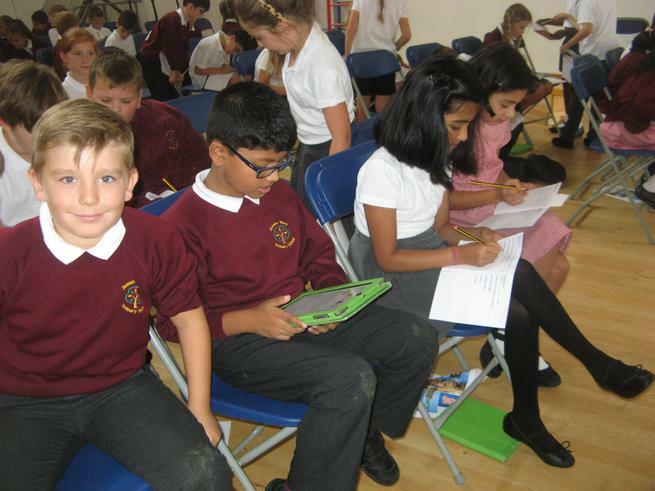 This week in Owls we had a fantastic Science afternoon preparing and making the resources that we need for our investigation on flight next week. 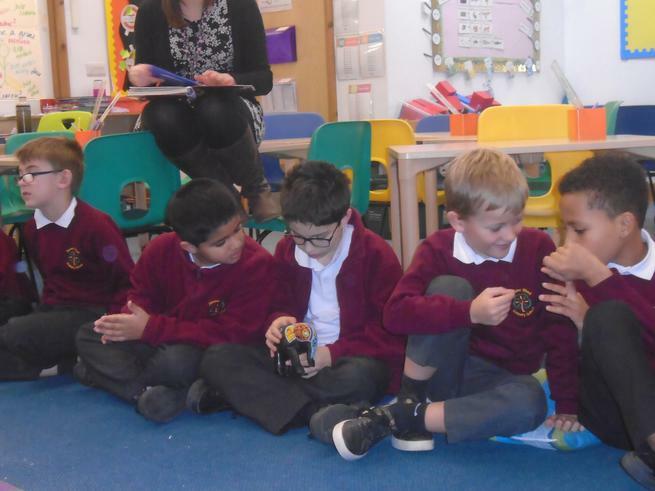 The children had previously planned their investigation and decided in a group if they were going to explore how kites or parachutes work. 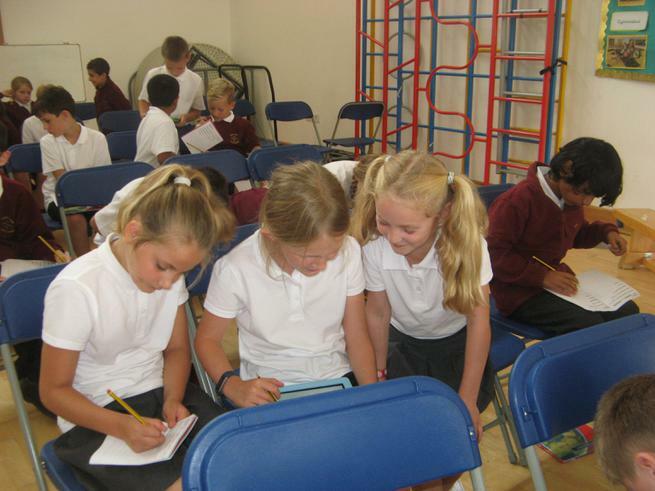 Each group worked incredibly well together and showed great collaboration and problem solving skills. 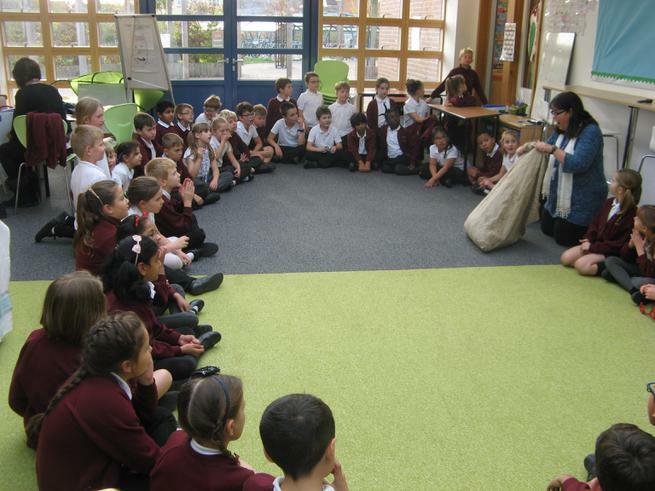 Ask the children what they are investigating and how! 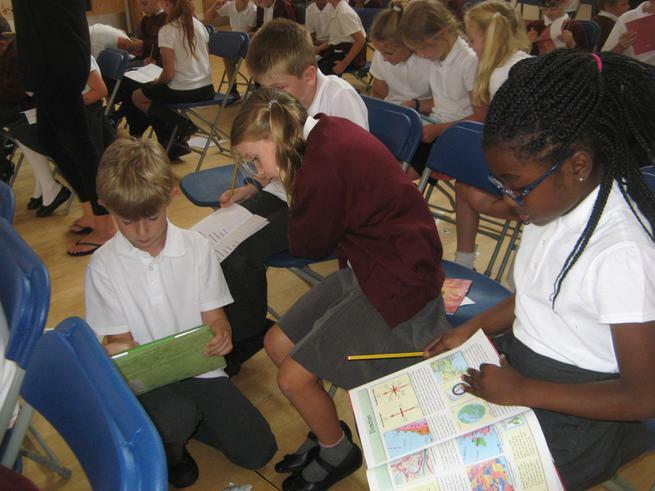 On Tuesday afternoon Year 4 made their way to Gate 4 at the JW Airport to board a round the world flight. After watching an inflight safety video, we took off and could see the clouds rushing by the wings of our plane. 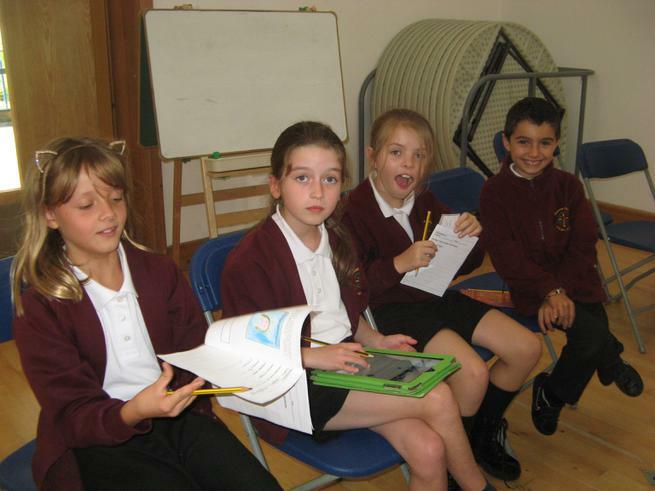 We landed in an unknown destination and had to find Mrs Orange to get some picture clues. 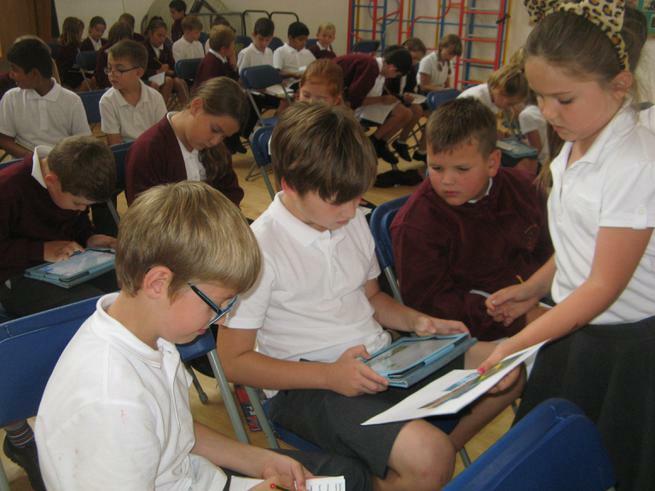 Using ipads and atlases we then had to find out what city and country we had landed in, as well as the language we would have to speak, the currency to use and research some facts of our own. 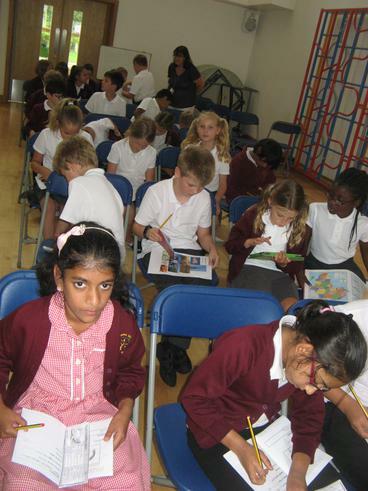 We each had our very own passports where we could record all our information. 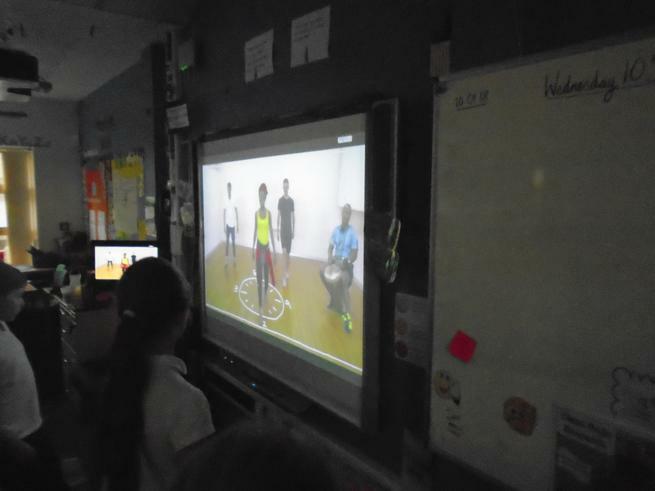 In the course of the afternoon we visited; New York, Rio, Egypt, Sydney and Beijing! 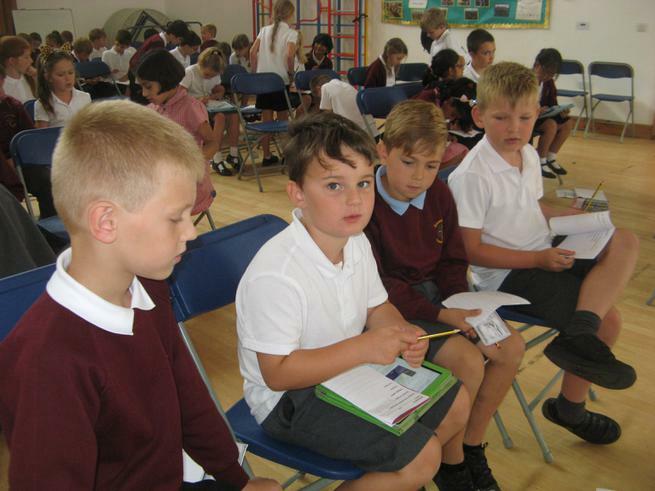 We even found out the distance travelled and duration of each flight. 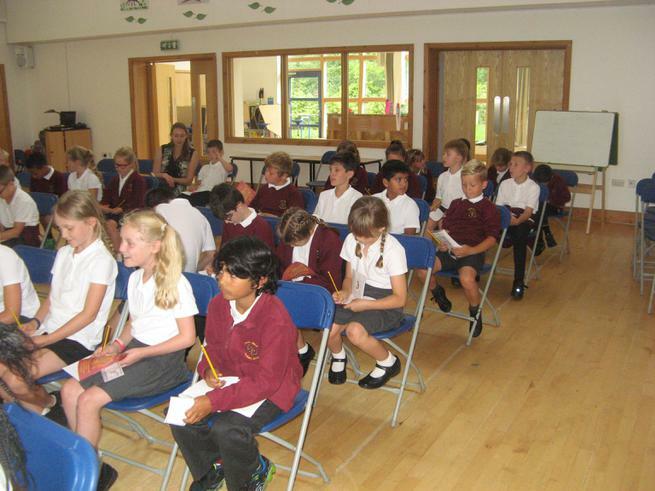 We certainly had a case of jet lag by the time we landed, but what a fun way to kick off our Flight topic!